Email marketing is the number one most effective channel for ecommerce businesses. It speaks to both existing customers and prospects. It builds brand assets and, ultimately, grows your bottom line. The only reason anyone says email marketing is dead is because they aren’t very good at it. And when you aren’t very good at it, you won’t get any of the benefits. Let’s just look at the numbers really quickly. A good ecommerce conversion rate will hover at about 3-5%. That means, then, on average, 95-97% of the people who come to your website will leave without ever buying a thing. Capturing the email addresses of those 95-97% of people and building engagement through email is your most cost effective route to turning these browsers into buyers (and retaining existing customers). In my 6 years at Sumo.com, I’ve sent more than one hundred million emails – and I’ve learned a thing or two about what works, and what is just industry hype. You can retarget ads at them, but you’re bidding on those placements and you’re restricted in what you can say. With email, you own the channel. You can say exactly what you want, as often as you want and for relatively little cost. Now, just because you can say what you want as often as you want doesn’t mean you should. In my 6 years at Sumo.com (and AppSumo! ), I’ve sent more than one hundred million emails –– and I’ve learned a thing or two about what works, what is just industry hype and how to get customers to actually talk to you, and like it, too! Now, I’m distilling that information to you, from how to talk to your customers, what not to do (based on what I did and failed at doing), what I’m almost 100% sure you are doing wrong already without even seeing your emails and how’d I’d think through it all if I were starting over. You want to build a relationship with someone through email. Let’s start with the basics, then. How do you build a high engaged and valuable relationship? I call this the spousal technique. Now, I don’t know if you’re married or not, but if you have a husband or wife, then you generally have 100% open rate when you send them an email. How can you get your customers to do the same? You build a relationship and you treat them the way you would someone you care about. That means, you are invested in building a relationship. I don’t like lying ones. Those piss me off and I generally stop trusting the brand. I don’t remember what brand did this but they did RE: for like reply in the subject line like I emailed them, so it was a fake reply and it just looked like a lie to me. I really didn’t appreciate that and now I unsubscribed. Think about that. You also have to be considerate about what you are saying in your entire email, how you phrase it, why you are saying it and what your desired outcome is. You have to think through it the same way you would with your spouse or a good friend. Invest in building that relationship. The easiest thing that most people forget is just to keep it really simple with your customers. What I do personally on my own site –– okdork.com –– is once someone subscribes, I send them an email asking them what the one thing is I could to make their day better. I literally get 50 responses a day from that email with specific requests about what I could do. That’s cool! People are engaging. They are responding. I’m getting to know my audience. What made you interested in our product? What were you looking to do with our product? What product could we make that you would love? And then, allow people to respond, and then respond back to them. Start real conversations with your customers. Get to know them, and work with them to better your brand. Now, if you already have a large subscription list (say 10,000 or so), then go ahead and just email them a questions. That’s a great way to show them you’re actually listening. That’s how you’re going to build customers for life. Where’s the next place you want to adventure? We’re going to pay $500 for someone to go on their next camping trip. You get all these people talking about it with you and around the web. You can then take that content, those questions and answers, create blog posts and copy for your landing pages or product pages. It all has a much longer life than just in your email. That’s what I do. People ask me all their questions, things I had never thought about in those ways. Then, I create content that addresses those particular questions and needs –- the same way you would for your spouse or friend. At Sumo.com, we’ve sent more than a hundred million emails in the past six years. In that time, we have tried absolutely everything. In terms of what I’ve learned in doing that, let’s start with first things first. No matter how many emails you have on your subscription list, nothing will matter if you have a terrible product. Email marketing only helps you if you have a product people are desiring. That’s the first step to making sure your emails get opened: have something people want. Once you have that taken care of, step two is a bit easier: stop stressing so much about what and when you send them. Here are the three biggest lessons I’ve learned to back that up. A couple years ago, we bought this custom segmentation algorithm and spent tons of time ramping it up to send specific emails to specific segments at specific times. It cost us a lot of money and a lot of time. And in the end, it didn’t do much. That was when I realized that segmentation is not as important as people think. That’s it, and then we focus on making sure that #2 email has the highest possible open rates. In our early days, we A/B tested our templates all the time. We were looking at the RPM (revenue per thousands emails sent) constantly. And that revenue number was going up. The problem didn’t present until much later. Those emails with high RPM had all these upsells and were very gimmicky. They made more money at first, but over time, they begin to hurt the loyalty and respect of our brand. In the long term, it hurt more than it helped. Take that lesson and remember to be considerate. A/B test your templates and work to increase your RPM, but do so with the long-term goal in mind. Too much gimmicky language and too many discounts or upsells discounts your brand –– and over time, effects that open rate and your relationship with the customer. People spend too much time thinking about about time of day. What day should I send it? What time should I send it? Now that we’ve got my mistakes out of the way, let’s talk about the number one mistake I see almost all ecommerce brands make in their emails: not enough CTAs. So many brands only put a CTA in their email at the end of the email. Come on –– very few people who open that email are going to make it down the page. You don’t think like this with your homepage on your site. You know that “above the fold” space is valuable. Don’t make people scroll to get to the part where you want them to take action. People are on their phones or in the bathroom (or both!). They’re busy –– and distracted. You need to put your CTA in that email a few times to make sure they see it and can click it. Don’t have a “Buy Now,” a “Read More” and a “Join the Conversation.” You won’t get anyone to do anything with that many options. For more on email mistakes, check out Connectio.io’s guide. For most people, you can just throw on Sumo.com, or any list builder software and a few of our tools or whatever tools are out there. In six months, you’ll have a decent size list of people you can communicate with about your product. That’s the number one thing to do if you are launching a new business or a new product line: catch emails right away! Catch emails right away, make sure the product is really desirable then regularly communicate with your audience. Start collecting emails: Get a landing page up –– better yet, make it a welcome mat. Get it set up today. Begin to communicate regularly: Setup an autoresponder for anyone who signs up through that. Have that autoresponder be three emails that go over over the first day, third day, seventh day. People lose attention and open rates go down over time. Most people have already taken the most action they ever will with your brand when they’ve given you their email address. So email them right away to keep that excitement up! Make sure the product is desirable: Spend 80% of your time building a product or service that people are really excited about. Use the landing page and autoresponder to tease the product, but then begin collecting feedback. This all goes back to my #1 rule: email won’t work if you have a terrible product. So, make sure your product isn’t terrible! Craft a community from day one: Link your landing page in your email signature. Send it to friends and family. Get a Facebook page launched and start promoting that, and create not just a business page, but a community. Ask questions. Engage with your audience. Figure out exactly what the product needs to be to get them really excited. Say I’m thinking about starting a gum company called Noah’s Chew. If I was starting Noah’s Chew, I would spend an hour setting up the domain, putting on Sumo.com with the Welcome Mat and then I would link it in my email signature and say: “Hey, if you like gum –– go here!” to begin collecting emails. Then, I would spend the rest of the time making a really great product and sharing those updates with the customers. When the product is ready, I have 1,000 hungry people that will chew on whatever gum I’m sending out. Clearly add anyone who buys your product to your email marketing list. You’d be surprised how many people don’t do that simple and obvious thing. 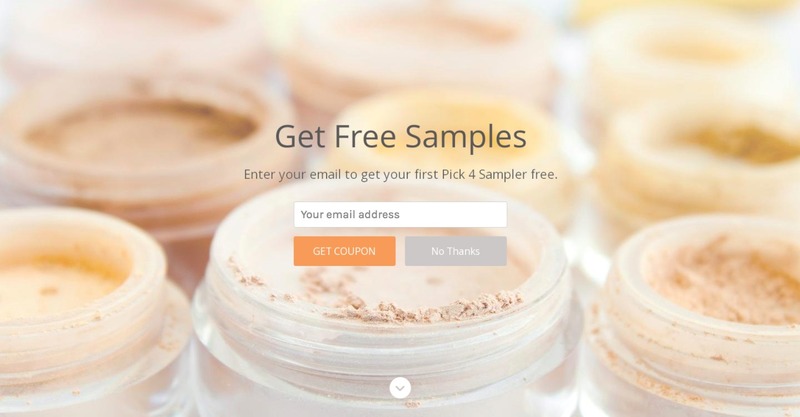 Then, whenever you sell out of something, make sure you have an email collect on the product page. In the above example, So Suzy Stamps is using the app InStockNotify, which you can install here. According to Suzy, 80% of people who sign up for these emails end up purchasing. 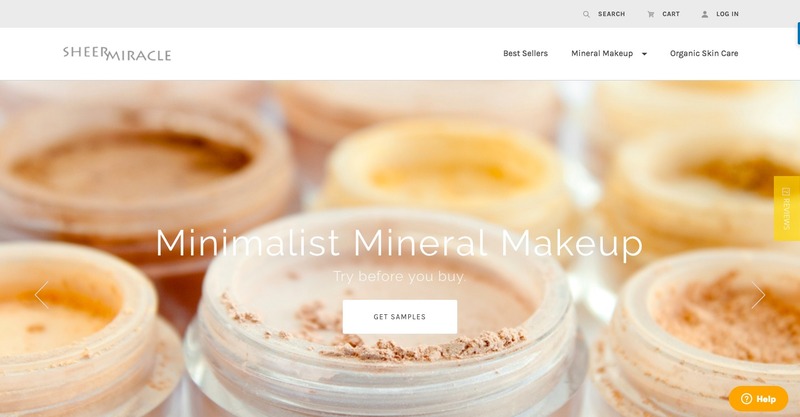 Atlanta Light Bulbs is using PriceWaiter, a BigCommerce app, to serve the exit intent popup. PriceWaiter also serves up the The Let’s Make a Deal feature with which Atlanta Light Bulbs has seen a 30+% increase in conversion rate. We have a tool called the Welcome Mat that has been really successful for a lot of brands. This is essentially a landing page that is styled very similarly to your own site, but offers only 1 CTA rather than your homepage which is merchandised. Here is Sheer Miracle’s Welcome Mat (image 1) and then their actual homepage (image 2). Here, you can ask for an email, offer a discount and work to grab the email up front rather than having to wait until they are about to leave. Add email opt-in options and product recommendations on your receipt emails with a tool like Converio. Say, “Hey, join our newsletter or forward this to a friend and get 10% off!” That’s worked really well for us. Install Conversio and begin optimizing your receipt emails for free right now. One thing I’ve seen a lot of ecommerce sites do really, really effectively is give discounts for just new customers. Here’s an example of a pop-up for 10% off on a first purchase from Camp Man. In addition, using a pop-up to capture email sign-ups has the potential to generate a 10x increase in subscription rates. Finally, you want to make sure that your emails are working to increase sales and engagement. If you’re sending a sales email once a month and you’re not generating any sales, you need to figure out why not. People loved to be asked for their opinion, so let them spill it to you. You’ll learn a ton about what isn’t working and what you can incorporate into future emails to make them more successful. Plus, you’ve created a better relationship with your customers in the meantime. And do this every single time something doesn’t work. People love consistency. For your own business, in order to grow, you’ll need to be able to consistently predict how you’ll be doing in a month or two. Consistency matters –– both for you and for your customers. So begin that cadence now. If an email isn’t working, set the expectation that you will ask your customers why not, and then you will incorporate their feedback to make it better. This is the communication loop that makes email marketing your highest revenue and engagement channel in ecommerce. Noah is an expert in the marketing space, having built Sumo.com from the ground up and before that being employee #30 at Facebook and #4 at Mint. Get regular insights and actionable steps from him here. Noah Kagan the Chief Sumo at Sumo.com and AppSumo.com, where his team helps entrepreneurs kick more a**. Before that, he was a cubicle monkey at Intel, #30 at Facebook and #4 at Mint. He writes on his blog, OKDork, about his experiences with starting a business, personal improvement and productivity tips.